It is fitting that I’m sitting by and watching the transformation of my regular old daughter into mini royalty as I am currently reading a book called “Cinderella Ate My Daughter: Dispatches from the Front Lines of the New Girlie-Girl Culture” by Peggy Orenstein. I’m only shortly into the book but I’ve already read some fascinating information. Here are two studies by researchers that really caught my attention. Researchers took two groups of middle school age girls and showed them a series of commercials and then had them fill out a survey asking them what they wanted to be when they grow up. One of the groups watched commercials of neutral things like phones and pens. The second group of students watched the same commercials but this time they added two commercials that showed women in traditional gender roles. The commercials were for things like acne medicine or brownies with images of women smiling over the stove. After the kids watched the commercials they had them fill out a questionnaire asking them about what careers they might be interested in. The girls that watched the commercials that had the women doing things like fretting about their skin or cooking brownies showed less interest in science and math based careers. Think about this outcome. What does t.v. and the media do to our children and specifically to our little girls and women of the future? Researchers took two groups of college students and had them try on either a sweater or a bathing suit before taking a math test. These were all students that were good at math. They then looked at the scores to see if there were any differences that would not be due to chance. This is what they found. The young women who took the math test after trying on the bathing suit did worse than the group of women who tried on the sweater before taking the math test. The boys did the same on the test regardless of whether they tried on a bathing suit or a sweater. Body image. Self esteem. How we feel about ourselves. It can affect how one performs on a math test. These statistics are mind boggling and frightening. 42% of six, seven and eight year olds want to be thinner!? 81% of 10 years olds are afraid of getting fat!? What kind of world are we living in? 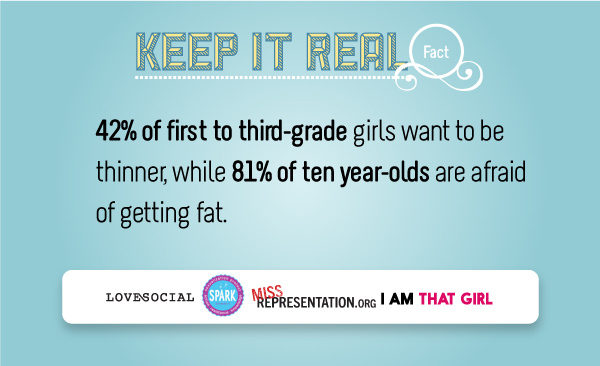 The Keep It Real Challenge, which runs from June 27th – 29th, 2012, is designed to start a media revolution and help girls, women and their allies realize the power of their individual and collective voices to create positive change. SPARK Movement, MissRepresentation.org, I Am That Girl and LoveSocial have joined forces to host this three-day social media campaign to urge print magazines to pledge to use at least one non-photoshopped image per issue. Pledge to print at least one unphotoshopped picture of a model. Day 1: Wednesday, June 27: Tweet it. Twitter users will use hashtag #KeepItReal, directly asking magazines to pledge to change their practices around photoshopping bodies. Day 2: Thursday, June 28: Participants will create a blogging firestorm – personally reflecting on how unrealistic images of beauty have impacted them. Day 3: Friday, June 19: On the final day, via Instagram, users will post their own photos of “real beauty” to be entered in the #KeepitRealChallenge – with selected photos to be featured on a billboard in New York City later this year. On the Miss Representation website (http://www.missrepresentation.org/) there is a pledge you can take to end sexism. In response to that I received an emails with some tips for raising young girls in a non-sexist way. Thanks for joining our movement to end sexism! 1. Tell 5 people about the film and share one thing you learned from watching it. 3. Remember your actions influence others. Mothers, aunts and loved ones- don’t downgrade or judge yourself by your looks. Fathers, uncles and loved ones—treat women around you with respect. Remember children in your life are watching and learning from you. 4. Use your consumer power. Stop buying tabloid magazines and watching shows that degrade women. Go see movies that are written and directed by women (especially on opening weekend to boost the box office ratings). Avoid products that resort to sexism in their advertising. 5. Mentor others! It’s as easy as taking a young woman to lunch. Start by having open and honest conversations with a young person in your life. You are now dialed into a national movement to stand up to sexism and challenge the media’s limiting portrayals of gender. Together we will make a huge impact on contemporary society.